As predicted I’m inching my way through the edits, and as predicted, we got a lot of snow. But it’s April and I’m pretty much over winter, so I didn’t take any pictures. I’m up to page 50, but surprisingly, this isn’t a slog. Not only that, but I’ve (easily) cut five pages. I’m really enjoying going through the manuscript at this pace. That being said, I really hope this is the last major edit I need to do. In exciting news this week, I listened to and approved the extended sample for the audiobook version of Coffee and Ghosts. The narrator is amazing, and I am So. Excited. 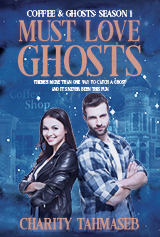 Must Love Ghosts (Season One) is up first. I’m really looking forward to listening to the rest of the episodes.